A fairly clean Christian allegorical fantasy, which does contain alcoholism. John the Sword Bearer has come home to Earth with his father, but adventure calls him once again when he follows a frightened girl who is running from her drunken father into a snowy night, and her footprints suddenly disappear. She has gone to another place, just as he did when he ran away once. Seeking the girl, he returns to Anthropos: but it is no longer the land he remembers. The morality here seems to be fairly clear-cut. Sin happens: it is wrong; it can be repented of and forgiven. The creator and his messiah are worthy of obedience, love, and worship. Enemies of the creator attempt to steal his people and to thwart his plans, but they will always be conquered. 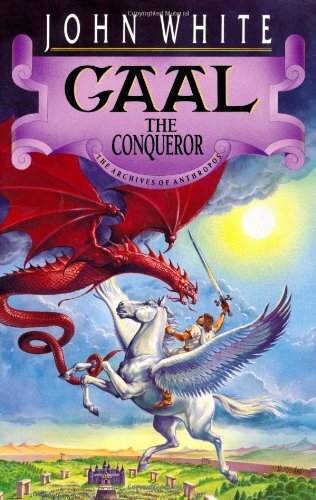 "Gaal the Conqueror," like "The Sword Bearer," features the Changer in the role of God and Lord Lunacy as Satan. A new figure on the scene is the messiah, Gaal, who shocks John by claiming to be one with the Changer, and features in some scenes which portray his sacrifice, conquest of death, and the power to redeem and change servants of Lunacy. While prophecy can still occur, prophets or seers are not present in a formal capacity in this time period. Lord Lunacy empowers magicians, who are prominent in his service, as well as controlling what appears to be a Greek god. Characters captured by Lunacy’s side are placed in something like a deep and unbreakable hypnosis and enslaved. Spiritually significant visions or hallucinations are viewed. Sacrifices are made on an altar. A temple is used as an enemy meeting place. Two men were in the army together. A man is abusive to his family, and chases his daughter with a knife. Another used to get into bar fights. An animal is burnt to death. Characters are bruised by a fall. Trees try to eat people. A character speaks of his impending death, and is later mortally wounded in battle. Skeletons are seen surrounding poisoned water. A written message references an attempt on someone’s life. Goblins liquefy when killed. An earthquake levels a city. A character threatens to kill. More than one person dies (temporarily). A man overindulges in beer on a regular basis, and behaves recklessly and violently while under the influence. Another man is a former alcoholic. The wine of free pardon, symbolic drink of forgiveness, makes an appearance. There is poison, and there is magical or blessed water which heals and invigorates. It is implied that a girl may have been sexually abused. A sign in a forbidden place warns to “not awaken love before her time.” It is briefly discussed that the local human culture practices arranged marriage. None found on a cursory re-reading. Characters use the word “accursed” to refer to a group of characters who seem to have all aligned with the enemy. Two characters are said to say some very ugly things to each other when arguing, but their words are not given. Much of what we find in Anthropos will not be unfamiliar to fans of the fantasy genre. It is not groundbreaking or exceptionally original. It repackages a great many fantasy tropes. However, there are still some moments in this book which seemed lovely and meaningful to me, and if you are not disturbed by clichés, it may be an enjoyable Christian fantasy read.